Welcome to Share the Point . . .
White & White Consulting has been providing technical training, consulting, and networking services to clients throughout North America since 1988. 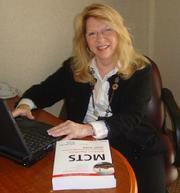 Its owner, Marilyn Miller-White, provides more than 20 years of experience with Microsoft technologies. Since the advent of SharePoint 2007, she has become passionate about SharePoint as a tool for collaboration and content management. An acclaimed author and subject matter expert in all areas of SharePoint, Marilyn can provide customized training and consulting for your company. Copyright © 2011 White & White Consulting. All Rights Reserved.